Are you aware that even if your small business is generating a profit you could still go bust? In fact 60% of businesses that close down are profitable but they simply run out of cash because of poor cash flow management. As a small business your are often so focused on generating new business, servicing customers and taking care of a million other tasks that need “urgent” attention, that you can neglect one of the most important elements for a successful business. Especially if your business is growing and things are looking great on paper, this can be a time of extra concern. As your expenses grow to keep up with demand and increased production any shortfall in cash flow will be magnified to the point were you simply run out of money. In this article I will share with you a few simple tips to ensure your business always has cash flow to operate, grow and pay you a regular income. It’s your responsibility to set up payment and invoicing terms that work for your business. So why do some small businesses, freelancers and contractors offer “30 day payment terms” to customers? This is a sure-fire way to kill your cash flow and leave you struggling to pay your bills each month. Yet so many small business owners do set these payment terms with very little thought about the negative effect it will have. 99.9% of customers will have no problem paying invoices within 7 days if requested and you deliver great products and services. Also if you make your Terms Of Trade clear to new customers on your quotes and invoices, then everyone understands when payment is due before the transaction is agreed upon. Ask our experts to review your Terms Of Trade with a free no obligation consultation. Why wait til the end of the month to send your invoices? This should be a part of running your business that you enjoy. As soon as someone buys or agrees to a quote you have provided, send the invoice immediately, or if you’re too busy to do it then and there set aside time at the end of each day to send new invoices out. Without cash flow your business will fail, so do your part to ensure your accounts are paid in a timely manner. Depending on your industry this may or may not be possible, but when appropriate it is always a great idea to ask for an upfront deposit. However you structure your payment options be sure to think long and hard about how this will affect your business and operating cash flow. Many small businesses request a 50% then payment within 7 days of completion. Depending on the nature of your business this may need to be adjusted, but it is definitely worth trying to figure out how to get at least partial payment upfront. It’s your job to make it as easy as possible for people to pay you. Everybody is busy and sometimes even great customers can’t set aside 5 minutes to pay your invoices on time. So when sending your invoices have your payment options highlighted, with clear instructions and payment details. Direct Bank Transfers: Ensure your account details are clear and complete. Credit Cards: Offer a credit card facility and take payments over the phone. Paypal: Offer online payment methods such as Paypal. Automatic Payments: If you have clients you work with ongoing, set-up automated payments so the money goes into your account every month like clockwork. Sometimes you can do everything right and still not get paid on time…or at all. That is when you need to have a system in place to follow-up overdue accounts. In this article we explain the right way to collect unpaid debts Small Business Debt Collection. Or you can contact a professional debt collection agency to help recover the funds. The above tips will all help to ensure you remain cash flow positive, able to cover business expenses and also pay yourself an income. Is it certain types of clients who always pay late? Have you noticed when things get busy you take longer to send invoices? Do certain types of projects drag on leaving you waiting for payment? By looking into your cash flow patterns you can identify what is working well and what is not, then address those specific issues to improve cash flow in the future. 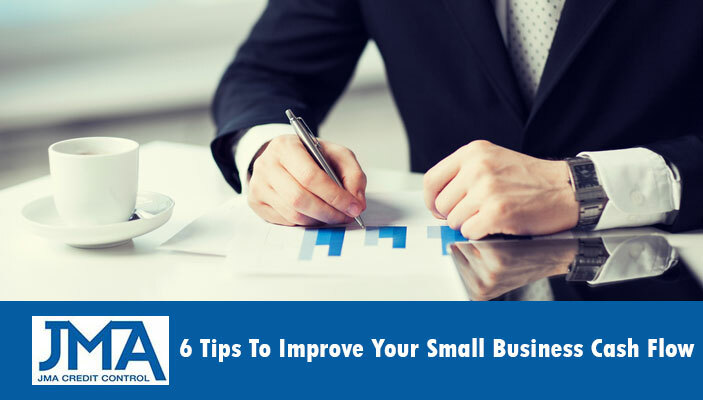 If you have any questions about implementing any of these tips in your business please comment below.